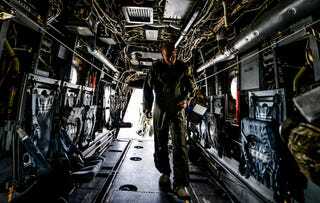 His is Technical Sergeant Edilberto Malave, 'from the 8th Special Operations Squadron flight engineer, conducting a preflight inspection of a CV-22 Osprey on Hurlburt Field, Florida.' But if you tell me it's Vin Diesel entering the set for a new Aliens movie, I will believe you. What an awesome cable mess. It's a pretty pretty pretty cool aircraft.